A Top 30 Under 30 award winner, Kuliavas is a management executive with a proven track record of business development and market growth. His involvement in aviation began with the start of his pilot training while still in University; since then, Kuliavas has held various executive positions in the private aviation industry, aiding Fortune 100, Fortune 500 and ultra-high-net-worth individuals with strategic purchase decisions. While Vice President, Sales & Business Development for Canada’s first, and largest, private aircraft fractional ownership company, he grew his territory sales to be the most successful in the company through increased customer engagement and driving brand recognition. 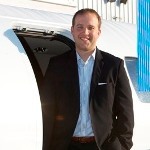 He now directs Sales & Marketing in Canada for Swiss aircraft manufacturer, Pilatus, helping grow a market that is home to ten percent of the global fleet of its aircraft. Kuliavas is also the former Chairman of the World Lithuanian Youth Association, and the longest serving elected Board Member in the organization’s history. The WLYA’s mission is to represent the interest of the young Lithuanian global diaspora. Volunteering and philanthropic activities are top priorities for Kuliavas. For example, he advises diabeteshappens, a non-profit organization promoting a positive and proactive outlook on life with type 1 diabetes. He is also a Board Member of St. Michael’s Young Leaders— the board promotes the activities of, and has raised more than half a million dollars for, St. Michael’s Hospital in Toronto, Canada. Other passions of his include startups, fishing, flying, kart racing & volunteering. He is very involved in the sport of basketball, both locally and on the international level, and was formerly a United States University basketball coach.